Bridge Investment Group paid $18.85 mil for Cornerstone Plaza, a two-building multi-tenant office campus totaling 97.3k sf ($194/sf) in the heart of the Sorrento Mesa submarket of San Diego. The property was sold by Omninet. Built in 1996 and situated on just over five acres at 6160 and 6170 Cornerstone Court East, the asset is 67% occupied by a number of tenants including Broadcast Company of the Americas, Robbins Research International and Bentley Systems. The buildings are joined by a unique, furnished outdoor gathering space activated by an inviting water feature and bordered by lush landscaping and collaborative spaces. Cornerstone Plaza is just minutes from the I-5/I-805 interchange - two of San Diego’s main arterial freeways, providing tenants with easy access to all of San Diego county. Additionally, the I-805 HOV/Carroll Canyon project offers a direct access alternative to Cornerstone Plaza via Carrol Canyon to Pacific Heights Blvd. NKF’s Co-Head of US Capital Markets Kevin Shannon, Executive Managing Directors Brunson Howard, Paul Jones and Ken White, Senior Managing Director Rick Stumm, and Andrew Pascale represented Omninet in the deal. Bridge Investment Group was self-represented. 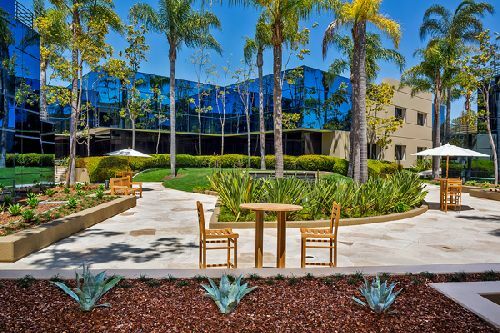 This acquisition marks Bridge’s entrance into the San Diego office market. According to Howard, Cornerstone Plaza offers the buyer immediate value-add potential. The property provides an opportunity to unlock additional value both in leasing up the existing vacancy and upgrading its multiple indoor and outdoor common areas.